B.A. 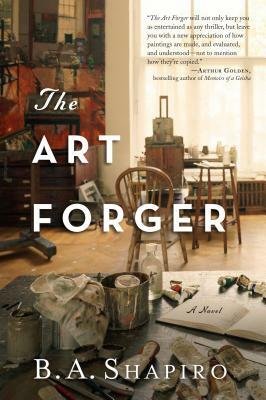 Shapiro’s The Art Forger not only explores the Gardner heist and forgery but also takes readers deep into the world of art in a compulsively readable novel. In March of 1990, two men dressed as police officers overpowered the guards at the Isabelle Stewart Gardner museum in Boston and stole 13 works of arts by the likes of Vermeer, Degas, Rembrandt and Manet. More than 20 years later, this theft is still unsolved, although earlier this month Andrew Parente, a man who has been linked to the heist in the past, was offered a plea deal on drug charges if he gave federal prosecutors information on the Gardner heist. B.A. Shapiro’s The Art Forger makes use of this, the biggest art heist in history, as the basis for an un-putdownable novel. A topical literary thriller complete with art, history, and romance, The Art Forger is our Red Hot Book of the Week. Three years ago, Claire Roth was a promising young graduate student in art, but these days she’s a virtual pariah in the art community, thanks to something that happened with her mentor Isaac and a painting of his. The only way she can get commissions these days is from Reproductions.com, a website that hires her to create reproductions of famous works of art that it can then offer for sale. It doesn’t pay particularly well, but it is work, and it keeps Claire painting. She has even become a specialist in Degas’ work. It seems as if Claire’s luck may be changing when Aiden Markel, Isaac’s former art dealer, asks to come to her studio to see her work. The proposition he makes, though, is nothing that Claire could have ever expected. She is being asked to forge a painting, a painting she recognizes immediately as one of the Degas masterpieces that went missing in the Gardner heist. Claire is hesitant to accept, but she needs the money, and Aiden swears that only her forgery will be sold and the original will be returned to the museum. As Claire begins to work with the Degas, however, she begins to feel that something is not quite right about it. To discover the painting’s true provenance, Claire must delve into Isabella Stewart Gardner’s past and her possible relationship with Degas.